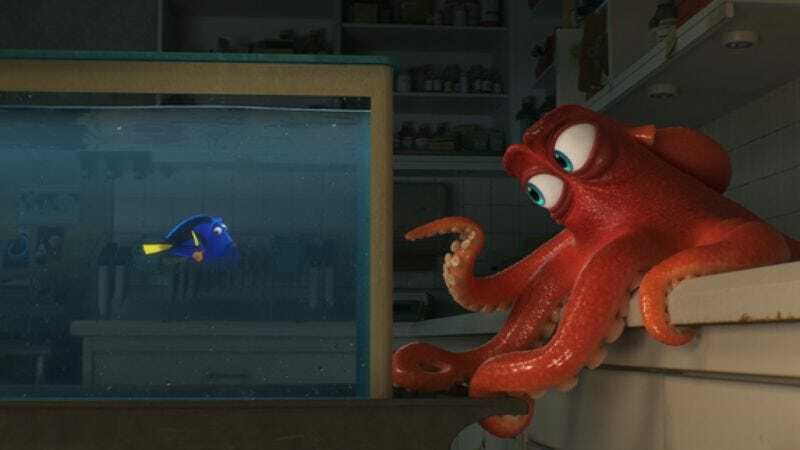 While a lot of the news out of Disney’s D23 Expo this weekend has been dominated by superheroes and Star Wars, the company also offered an update on Finding Dory, Pixar’s Finding Nemo sequel. As we’ve previously mentioned, the film won’t be about finding Nemo this time, and it will instead star Ellen DeGeneres’ absent-minded Dory as she goes on a quest to try and be reunited with her family. We already knew Dominic West and Idris Elba would be popping up on Dory’s adventure, but now Variety is reporting that she’ll be joined by fellow famous people Diane Keaton, Eugene Levy, Ed O’Neill, Ty Burrell, and Kaitlin Olson. Keaton and Levy will play Dory’s parents, Jenny and Charlie. O’Neill will be “a curmudgeonly octopus with seven legs” (a.k.a “The Pixar-est character ever”), Burrell will be a beluga whale, and Olson will be Destiny, “a whale shark who thinks she’s a whale.” Apparently Dory will meet up with O’Neill’s character (Hank) at the Marine Biology Institute Of California, and he’ll try to convince her to make “a questionable deal.” We figure that means he’ll try to trick her into giving him one of her fins to replace his missing tentacle. That’s how sea creatures work, right? Finding Dory will surface (get it?) on June 17, 2016.